Clio & Phineas: Finished! 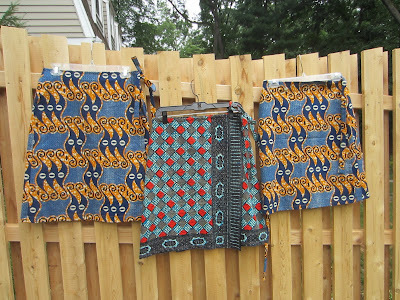 Wax Cloth Skirts for My Sisters! It feels like it's been weeks since I've had a sewing reveal! So, I am thrilled about this fun and easy project which was completed during mojo-explosion 2013. 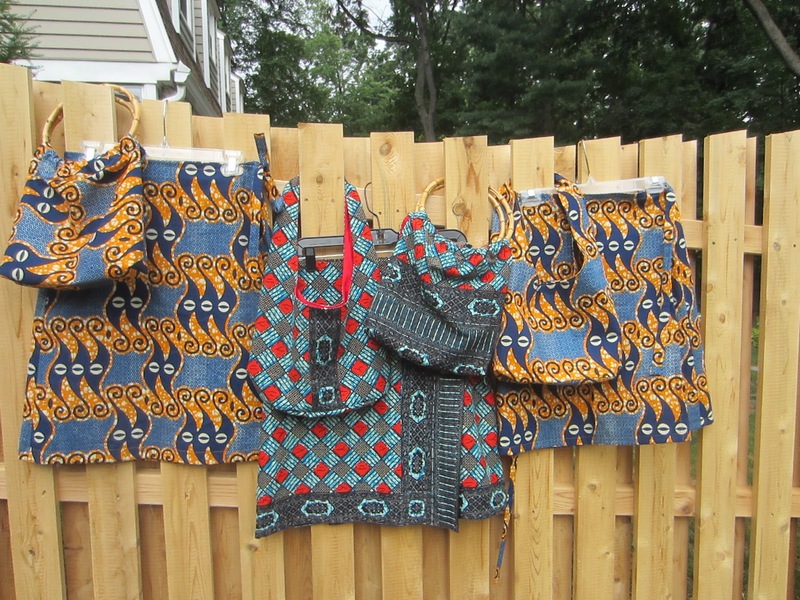 It's a matching tote and beachy wrap skirt for each of my sisters. There are four of them. 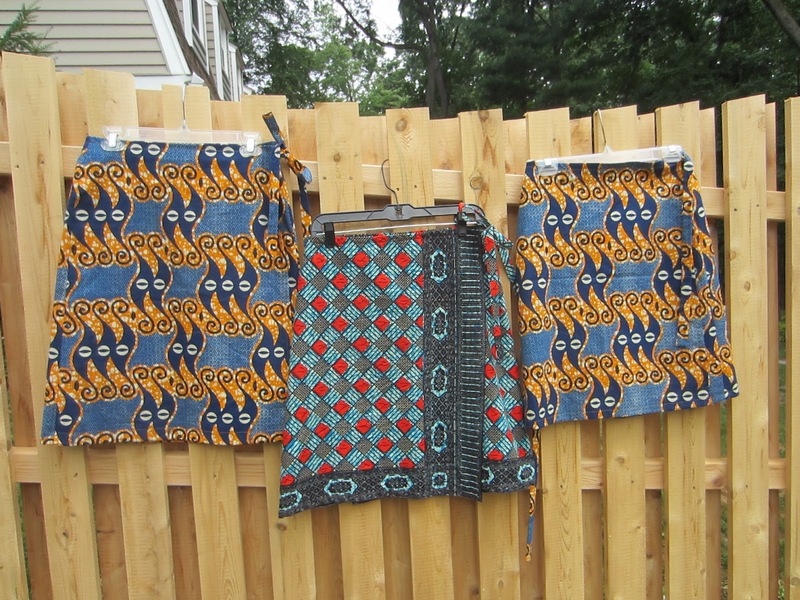 As a reminder, last autumn my dad gave me yards of wax cloth that he bought on a trip to Ghana to make something for myself and my sisters. Anyway, for the tote bags, I used Simplicity 5151 and made 2 of each version. This pattern could not have been easier and would be an excellent beginner project. 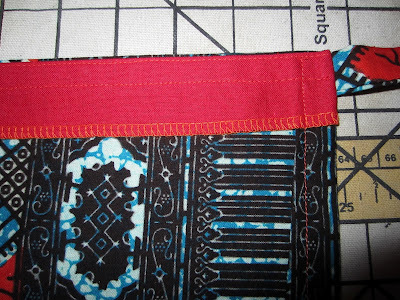 My only changes were to use a jumbo snap instead of velcro as the closure and to top stitch around the opening of view B (that is the one without bamboo handles). 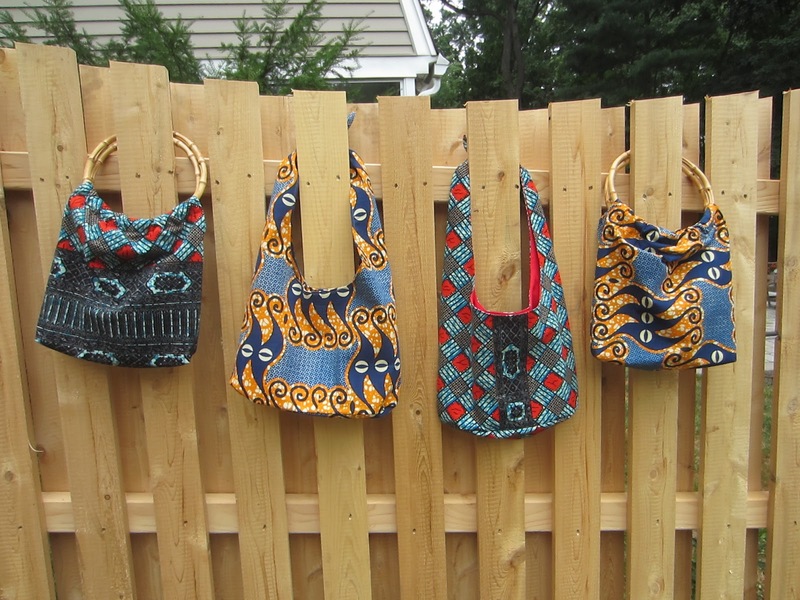 Four bags for my four sisters! 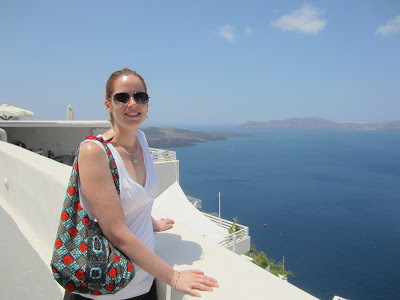 The inspirtation for the skirt was the tiered wrap maxi skirt that my mom wore to the beach throughout my childhood. It was simply known as "mom's beach skirt" to all of us and was only ever worn to the beach. For these skirts, I used Kwik Sew 2954, a basic wrap skirt pattern. My only customization was to adjust the length for each sister, and for my slimmest sister I made a slightly larger seam allowance since she is at the smaller end of the M size range. Three skirts (one sister was pregnant so we've delayed her skirt)! I'm impressed with the KS instructions for this pattern. I could have sewn this skirt without even looking at them, but I'm glad I did. This skirt uses some very good basic techniques that are explained and illustrated in a way that I think would be perfect for a beginner. Also, it doesn't skip steps. 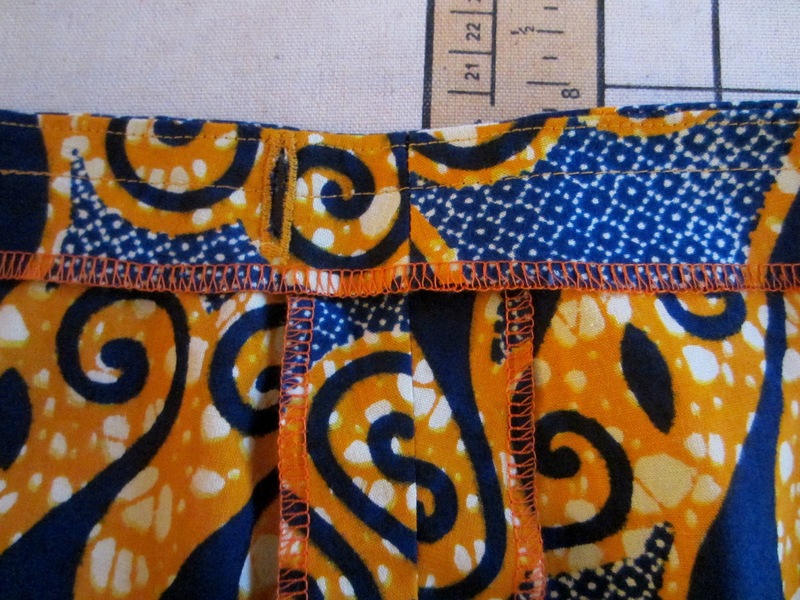 For example, it includes understitching the waist facing and actually explains why you do this. It also includes top stitching. A lot of "quick" or "easy" patterns tend to skip these basic steps, which ultimately leaves you with a sloppy looking finish. But not this one. If I was teaching someone to sew, this would be an excellent first pattern choice since you would most likely use a very stable cotton and it does actually have some good "challenge" bits for a beginner, like darts on the back and an optional button hole for the tie to thread through. As you can see, I used my serger for large parts of this project. It really sped my sewing along. Anyway, the skirts and totes are all either delivered or in the mail to my sisters. Here you can see that Calliope used her tote on our trip. Yay! So, I've crossed the "sewing for sisters" part of the project off my list and now it is on to the "wax cloth for me" project, which is at the muslin phase! Stay tuned! You are the Sister of the Year! Fabulous use of all that fabric! What lovely gifts! The way you used the border on the red wrap skirt is fabulous. The skirts and bags are all lovely. Such a nice sis, and props to dad for buying fabric during his travels! Your sister skirts and bags are beautiful Clio! Cute gifts!!! That gives me an idea as I have some wax cloth that I know probably will never make it to a garment but would make a wonderful bag. I think I had in mind wax cloth corsets all those years ago when I bought yardage. What glorius fabric and great results! Thanks for alerting newbies to this great pattern. Wow four sisters! I've got four brothers so I think you got the better deal. 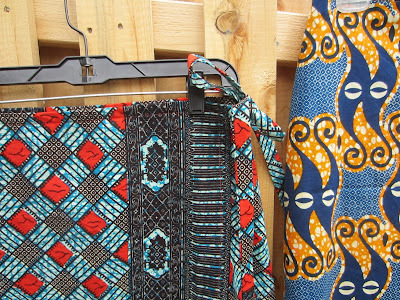 Lovely gifts and I'm rather keen on ethno prints. Well, maybe. At least I always had someone to weigh in on whether my shoes went with my outfit. But I'm guessing that you don't do too much sewing for your brothers. Yeah, really, you don't need to do much with such fun fabrics, do you? Thanks! Yeah, I was wishing that the blue/yellow one had a border, too. Yeah, right? Pop did a great job. The bags turned out very fun and cute. Go for it! We didn't know her, but apparently we had a very stylish grandmother who ALWAYS had a bag to match every outfit. So, this seemed like the right thing. Yay! These turned out so fun! Wow, totest are great and this fabric... 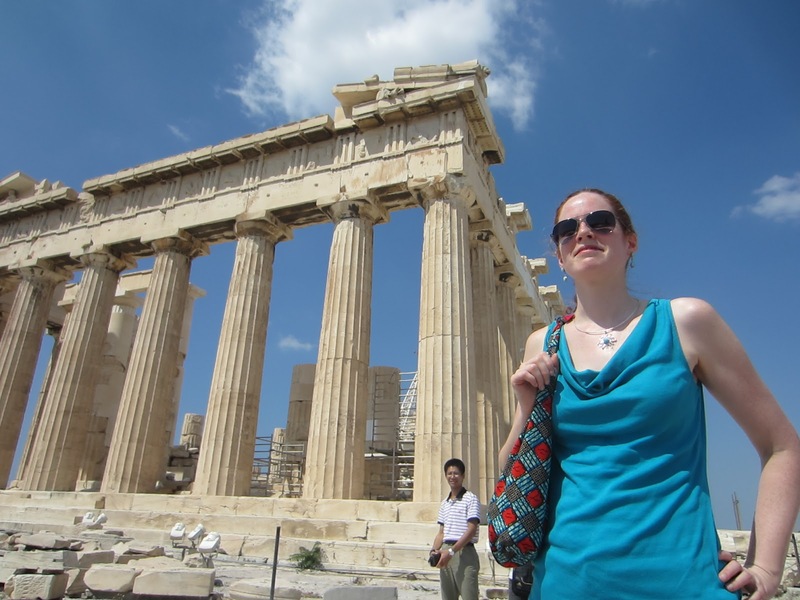 I wish my family ever thought about bringing such a gift from their travels. 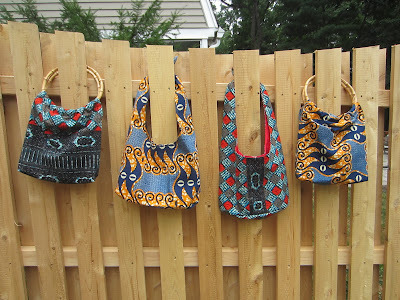 What a great sister you are, the prints are gorgeous and the patterns and bags really showcase them beautifully. You are pretty special in the sister department! One bag and one skirt for each sister...you are pretty awesome!!! Oh and the prints are very pretty too. Thanks, everyone! It was a fun and easy project all things considered! 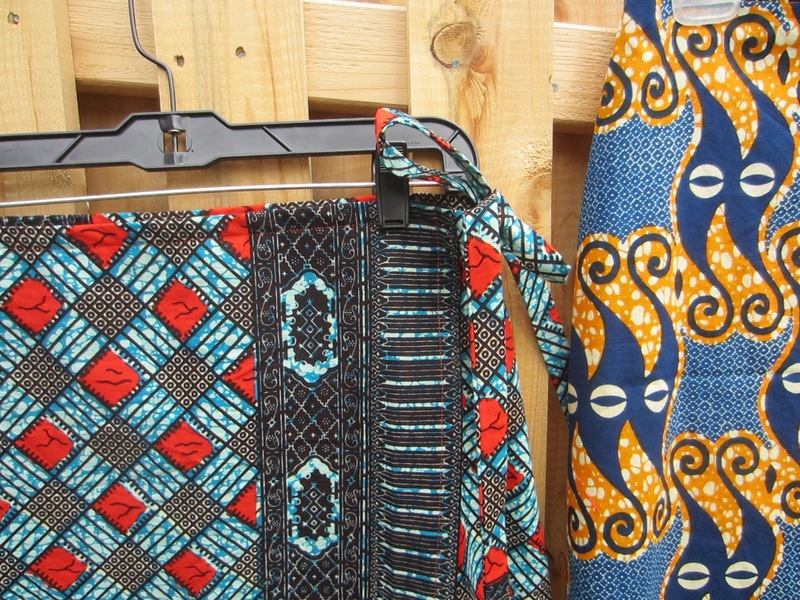 Cool bags and cute skirts, love tge the prints.